Many weeds that appear in your landscape beds and throughout your yard can seem harmless on the surface, but the plant’s roots can be causing some serious damage under the ground. Canada thistle, or otherwise known as cirsium arvense, is a perennial broadleaved weed with roots that can grow up to 20 feet deep and 17 feet horizontally. As you can image, this deep root system not only harms your turf grass, but makes it very difficult to remove. This is why Canada Thistle is Weed Pro’s weed of the week this week; read this article to learn how to identify it, find where it grows the most, and remove it from your lawn. This weed grows to about 2 to 5 feet with a slightly hair stem when young. This stem grows hairier with age and has alternate, oblong leaves. The upper side of the leaf is dark green and the lower side is light green and slightly hairy. This weed also has flowers that bloom between June and October. These flowers are pollinated primarily by wind, but also by insects that are attracted to the weed’s honey-like scent. The flower color can vary anywhere from pale-blue to purple, the majority of the flowers being a rose-purple. This weed grows well where summer temperatures are moderate and rainfall is not that heavy, making your Ohio backyard a prime place for this weed to occur. It can survive a wide range of moisture conditions and in various soil types. Although it can also tolerate a high salt content environment, it does not thrive in light, dry soils. The best environment that it survives in is in deep, productive, well-aerated soils that do not become too warm. 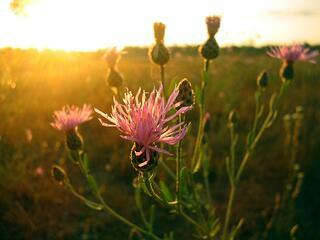 This means that many areas where crops are planted, you can most likely spot Canada Thistle. This weed can also be spotted in waste places, roadsides, and railroad yards. How to control the weed? Chemical Control- This weed can be killed with either Roundup or another 2,4-D weed killer. The weed killer will kill back the leaves on the plant and will kill back some of the root system. Can be applied on any sunny day, 65-85 degrees F.
You check back weekly and may have to keep having to reapply if they reappear. Organic Control- You just find the base of the plant and simply snip it off at the base. You force the weed to use up its energy reserves by regenerating and then by removing the new leaves before the Canadian Thistle has a chance to build its energy reserves back up. Does not harm any surrounding plants. You need to check back weekly and continuously snip off any new growth.